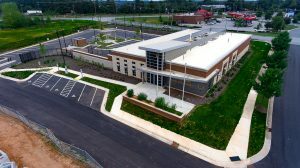 DAVENPORT was selected as part of the design team to provide parking lot and roadway designs for this new Police District office to be located at the corner of Somerset Drive and Hillcrest Center Circle. In addition to the proposed building, a new surface parking lot will be constructed on the existing vacant lot, and Winterhaven Lane will be extended to intersect with Hillcrest Center Circle. In addition to the designs for the parking lot and roadway extension, DAVENPORT’s scope included participation in public meetings.